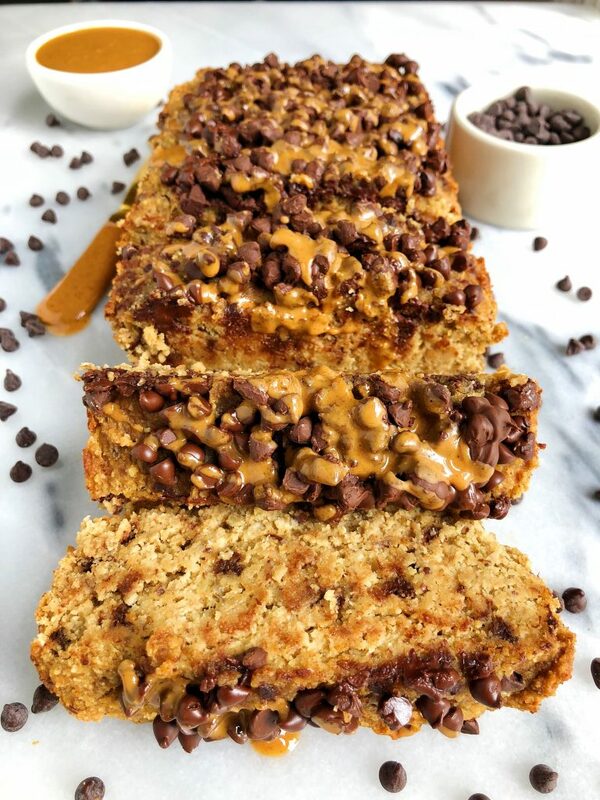 Gluten-free Chocolate Chip Banana Apple Bread made with all plant-based and grain-free ingredients for a sweet banana apple loaf with dreamy dark chocolate chips! My banana bread and apple loving friends, IT’S HERE! My new banana apple bread and it is officially my new go-to loaf, especially during the next couple months for Fall. Banana bread cravings hit all year around over here as you guys see. I try to eat “seasonally” whenever I can but when I love something, a season ins’t getting in the way. I am on the hunt for juicy organic apples all year around but when it is finally September and they’re at their prime. This Gluten-free Chocolate Chip Banana Apple Bread is insane. 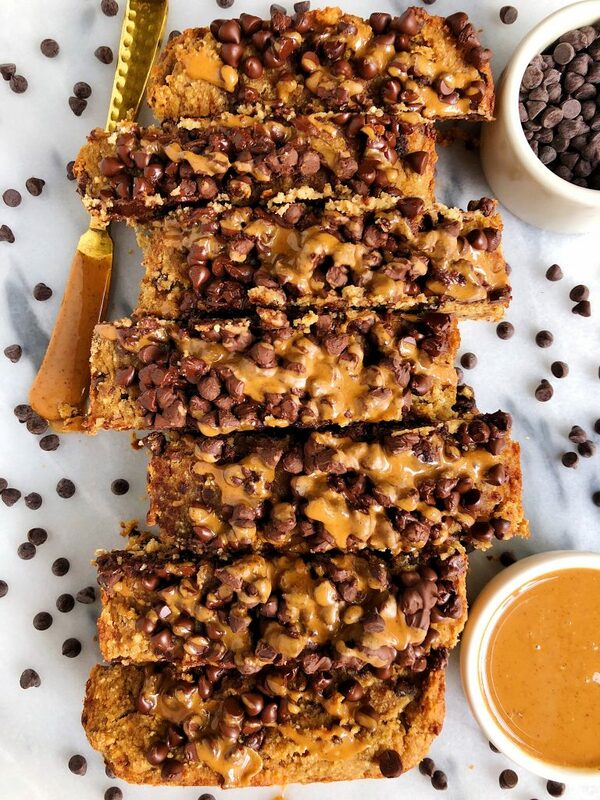 It combines all the dreamy flavors and with the addition of apple chunks and chocolate chips in the loaf, you are in heaven with every bite. You guys have likely seen me posting on Instagram stories about REBBL’s Banana Nut Protein about 7x a week. It is my absolute favorite flavor EVER and it is even in this recipe! It is one of their 3 new flavors they launched that I was able to taste at Expo West then patiently wait until they launched this summer. Let’s chat more about the Banana Nut Protein though. Besides the fact that it has 12g of pant-based protein in it, it is also filled with adaptogens and super-herbs like REBBL’s other flavors. It has turmeric in it, which is said to have anti-inflammatory properties and is used to support joint health and digestive wellness. It also has abhwagandha, which is really my favorite adaptogen since it is calming and support strength and vitality. After a sip of Banana Nut, you will think you are drinking banana bread (I’m not kidding). So just imagine how much flavor it adds to this bread! It is super creamy too thanks to the coconut milk base and brazil nuts they use (anyone else obsessed with brazil nuts?!). Thank you REBBL for this epic flavor. I don’t think anything will ever top this one in my life. If you guys decide to bake this loaf, don’t forget to share with me on social media. I have a gut feeling you are going to love this bread as much as I do. Plus it is plant-based, gluten-free and doesn’t call for a million ingredients – SOLD! 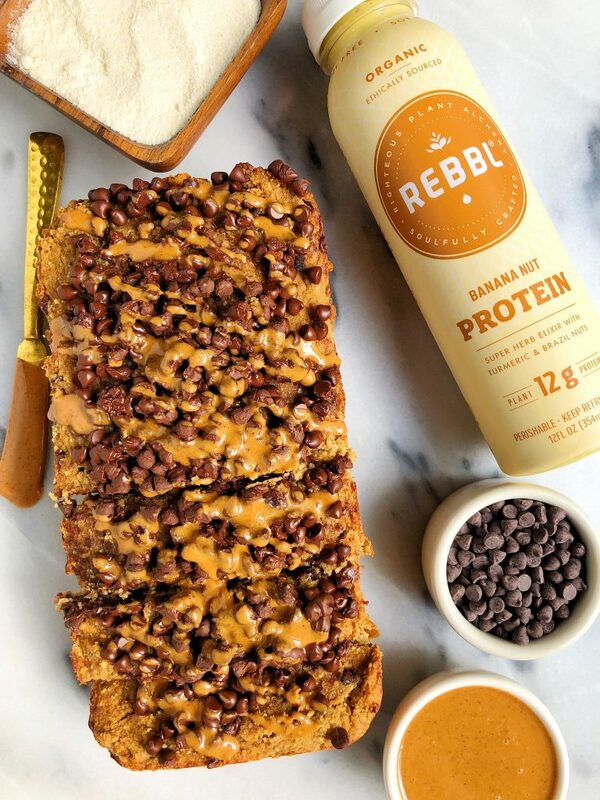 REBBLHere are also a few of my other favorite recipes using : Paleo Lemon Berry Pound Cake, Vegan Dark Chocolate Chunk Protein Cookies and Paleo Cacao Almond Flour Waffles. Thank you REBBL for sponsoring this post! It means so much to me to work with brands I love and believe in on the blog! Hello, for what I’ve researched it is practically imposible to buy rebbl drink outside the US (I live in Mexico) with what can I substitute this drink in the recipe? I’m assuming the apples get added when the chips get added. is there anything that can be used as a substitute for the protein shake? Just made this and it is sooo good! I used plain greek yogurt instead of the Rebbl drink. So moist and yummy!